With a very few simple tools (many of which you probably already have in the workshop), you can make these delightful necklaces, earrings, bracelets, and pendants that Lisa Bluhm demonstrates. The same techniques are used over and over, so once you’ve mastered them, you’re all set to make all the projects that Lisa suggests…and there are a lot of them! 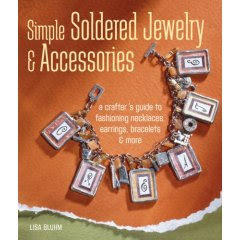 The strengths of the book as a wonderful introduction for beginners may be a problem for those who already know the basics of soldering. This book is a beginner’s guide, so don’t expect advanced techniques. It is beautifully photographed, as are all Lark publications, and the step-by-step instructions are flawless.